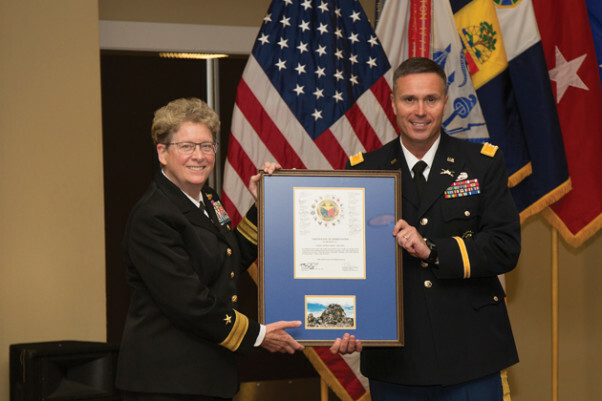 Col. Christopher Norrie, commander of Operations Group, presents retired Rear Adm. Sandy Adams with a certificate of appreciation after her speech at Fort Irwin’s annual Women’s History Month celebration March 28. FORT IRWIN, Calif. — Fort Irwin celebrated Women’s History Month with an event at the Sandy Basin Community Center March 28, featuring guest speaker retired Rear Adm. Sandy Adams. 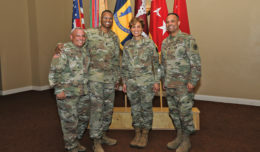 The event, hosted by Operations Group, highlighted stories from women’s 117-year record of official service in the U.S. military. More than 174,000 women currently serve in the U.S. Army, including more than 600 women Soldiers who are serving in infantry, armor and fire support specialist occupations. These numbers represent an immense shift from the early 20th century, when women were first allowed into the Army Nurse Corps in an official capacity. At the time, there were strict quotas limiting the number of women Soldiers, restrictions on what jobs they could perform, and caps on what rank they could attain, Adams explained in her speech. Women of color faced particularly harsh discrimination and segregation. Despite persistent service by women through all of the country’s major conflicts, it took a long time to change those policies and for women veterans to realize the same rights as their male counterparts. When Adams joined the Navy in the early 1980s, she did not know women could serve on naval ships. Thanks to a mentor, she found out about a recent policy change that allowed her and other women to do so, and she was assigned to the USS Puget Sound, based in Italy. When she first reported, she was one of five women officers out of 100 total officers, and one of just 110 women out of 1,000 Sailors aboard. She described it as one of the most rewarding and influential assignments of her 34-year career. While there have been many gains for women in the military, Adams said the biggest came in 2016 when the Pentagon declared that gender would not be a disqualifying factor for any military occupations, including combat specialties. Now, women can qualify on an even playing field if they meet the requirements of the job. By mid-2018, female infantry and armor officers will have integrated into 45 percent of FORSCOM installations. 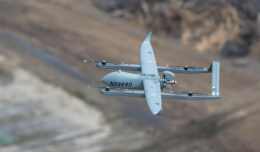 Here at the National Training Center, Operations Group has its fair share of the best and brightest, said Col. Christopher Norrie, Operations Group commander. 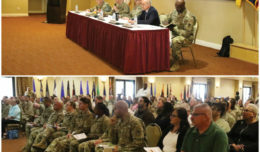 During the event’s opening remarks, he noted women Soldiers in Operations Group who are also marathon runners and classical pianists, immigrants and high achievers. “We have the greatest Army and the greatest military in the world because we have the greatest people serving in that Army, and in our military, today,” he said.